The “Roppongi Crossings” exhibition at the Mori Art Museum asks a brave question. It may be a ludicrous subtitle but I did admire it in passing on the subway, as I have recently asked similar questions. My own casual investigations were very much shot down but balancing on its fifty-two storey pedestal means the Mori Art Museum’s latest installment of “Roppongi Crossings” has a long way to fall. In truth, I made a similar comment about the last installment of this triennial exhibition. Yet, what is a little different this time is that it has been trimmed from thirty-six to twenty participants and the curators have chosen to focus on artists that express issues in their work relating to five central themes: “Reference to society,” “Creativity of Genre-Crossing,” “Significance of Collaboration,” “Expressions of the Streets,” and “Aesthetics of the New Generation”. I prefer to pay less attention to such themes because of the way they are generated but in short the exhibition does aim to pick up where “Roppongi Crossings 2007” left off. If we consider some of the artists work on display with this interpretation, then we arrive at my understanding of Kubota’s point. What art has come to be in the public sphere is what has been puppeted by processes of design in the French interpretation. What this Crossings exhibition succeeds in doing is actually presenting us with some rare examples of the Latin interpretation. These artists make works, which denote an issue in society while engaging with it, and this is not easy to do. The temptation of course is to plan an artwork from idea to execution and this often leads to wretched ‘spectacle’ ridden pieces that aim to force their message down visitor’s throats. However, if considered as a seed, which needs encouragement and nourishment, an idea, through accumulation can build layers and layers of meanings that speak to visitors on a variety of levels. Each part of this process denotes a step for the practitioner to recognize and learn from. This artistic practice echoes a scientist in a laboratory and the results can be profound. 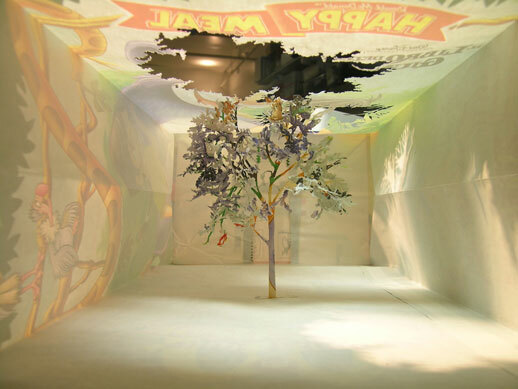 Take for example, Yuken Teruya, whose “Notice–Forest” series (1999-), fast food and designer bags with intricately cut out trees situated within them, are wonderful and can be appreciated not only for their ecological message but also for the time it must have taken to cut them out. Teruya’s other works aren’t quite as time consuming, but his practice is as much on display as the works themselves. With Yosuke Amemiya’s performance, hidden in a small corner of the museum, the artist’s practice is almost the display itself. Upon opening the door, you enter a dark room through a filing cabinet and essentially become a ‘piece’ of Amemiya’s space and therefore his world. 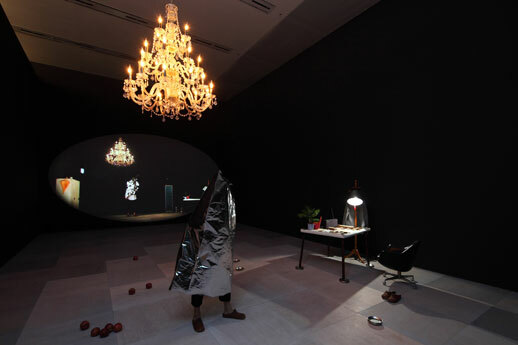 Projected on a far wall is a video of him in a mirrored version of the same space and in the video Amemiya is, for lack of better words, ‘potting around’ in his space with multiple red apples, multiple pairs of the same shoes, multiple buckets of water and some bags. The Amemiya present in the space watches himself on the video from time to time, mimicking his own activities, be it, taking his shirt off by lying on the floor; rolling apples around the room; or dripping water on the floor in lines, occasionally marking out connections between visitors watching around him. Every now and then, he disappears in another filing cabinet in the room, leaving the visitors in the room breathless with curiosity. In reality, the filing cabinet he disappeared into is connected to another exit out of the room for comfort breaks, but that illusion is never broken (unless you see him outside!). The work of Tsubasa Kato is also of note. Sadly, the most interesting part of his work cannot be experienced (at least in this exhibition) in the gallery itself, but the no-frills video documentation very much communicates a point, which is that the artist’s role is more to coordinate than provoke. Displaying the power of collective effort, the videos document teams of people trying to pull a large wooden construction, either right over or on its side. Each video is outside and carried out in all weather conditions, making each collective haul a unique experience. Moreover, Kato’s practice is clearly evolving in its own right, when you begin to notice that the large wooden constructions are different shapes, sizes so as to present different challenges. Very quickly, you get the impression that every event builds on the last and still conveys a message of collective efforts. Whether the colour of the wood is intended to echo that of stones comprising the Pyramids in Egypt is merely icing on the communal cake. Certainly, not all of the works on display convey the Latin interpretation of the word ‘design’. Morimura’s “A Requiem: Laugh at the Dictator, Schizophrenic” (2008) is loud and attention seeking but I was always told that shouting won’t get you anywhere. Morimura’s intentions may well be to question what art is, but in terms of connecting with an audience, Kato, Amemiya and Teruya are hard to emulate and tough to follow, even for an icon such as Morimura. Many would also note that there wasn’t any painting present in the show. Followers of the Turner Prize are familiar with such ‘scandals’ but to not represent even one painter out of twenty is to make a strong, and perhaps even deliberate, statement. From my own experience, painting can complicate definitions of what art is, but I don’t believe for a minute that painting is garbage. Some of the most recognized scientists and philosophers in history were well acquainted with the practice of painting and I have no doubts that it is still alive and well. Perhaps ‘art’ is the wrong word and perhaps ‘design’, in its popular use today, is also the wrong word. But what I can say, is that on its third attempt, the Crossings exhibition has finally unearthed, albeit a few, ‘creative practitioners’ that better represent the aim of the word “Crossing”. 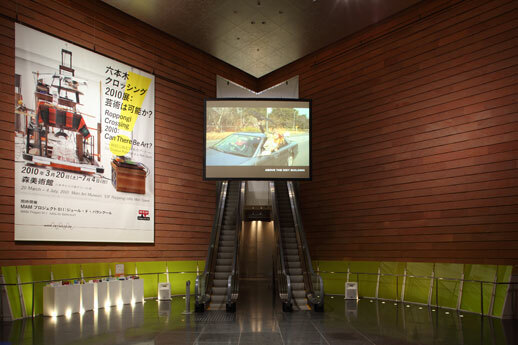 1 Kubota, K. (2010) Art as Possibility, in Roppongi Crossing 2010: Can there be art? Exhibition Catalogue, p19.